Natural Solutions for Clean Healthy Ponds. 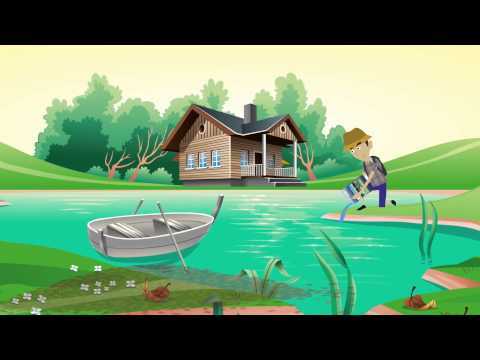 If you are a lake or pond owner whose water is stocked with fish, you know how important it is to maintain a healthy aquatic environment for the health and growth of your fish. Our products and regionally designed pond care programs for golf courses make it easy to maintain your course irrigation ponds and water hazards safely and naturally. Feel good knowing that you are providing safe and natural solutions to keeping your water healthy and clean. Our Planet's fresh water resources are derived from two sources: Ground Water and Surface Water. 70% of planet earth is covered by water, fresh water only accounts for 2.5% of this total. Our rivers, lakes, ponds, and coastal waters are not unlimited resources that can handle whatever we take out or dump in. These waters need protection. Pollution has wreaked havoc on the World. Around 70% of the industrial waste is dumped into the water bodies where they pollute the usable water supply. Fourteen billion pounds of garbage, mostly plastic, is dumped into the ocean every year. In America, 40% of the rivers and 46% of the lakes are polluted and are considered unhealthy for swimming, fishing or aquatic life. Pollutants also come from residential use. 80% of the water pollution is caused due to domestic sewage like throwing garbage on open ground and water bodies. Even detergents used in washing machines and dishwashers eventually end up in our rivers and oceans; also, the pesticides we use on our gardens. Koenders Water Solutions believes that we need to both clean surface water, while at the same time reduce the pollutants that are feeding into them. This is why we designed Nature's Pond! Koenders Water Solutions first designed a Natural Pond Care program that included all-natural water conditioners. 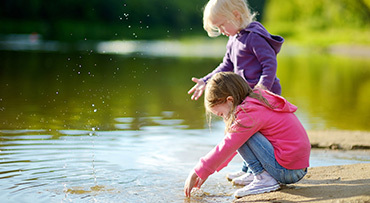 Pond and lake owners no longer need to use of toxic chemicals to treat water. The second challenge was to reduce the pollution coming into our fresh water resources. To do this we have created cost effective, all-natural solutions that are affordable and that WORK!!! Last year we decided that enough was enough and we needed to start taking care of our 1-acre pond. This pond was a mess, full of green scum, algae and muck. All the fish had died off except for the little fingerlings. We also use the water for some of our household uses and it was so smelly that when it came out of the faucet it would stink like rotten eggs. We decided to follow your Nature's Pond Care program. The first thing we did was install a Koenders Windmill Aeration System, and then at the same time as installing the windmill we treated the water with Nature's Pond Conditioner. Within a week or so we started to see some improvements in the health of our water. I never realized this but at one end of our pond there is actually a sandy beach, we thought it was just mud! The water has stopped smelling and our fish are growing. A year later I am seeing some 1 lb bass in our pond. The pond is now clean and clear and we can swim in the water this year. I just purchased our annual treatment of Nature's Pond Conditioner to ensure that our pond remains clean and healthy. Finally, something that works! We love our current windmill so much we bought another one. We have had a Koenders windmill up and running for nearly 20 years. It has been the best way to provide oxygen to our pond that is close to 2 acres in size. 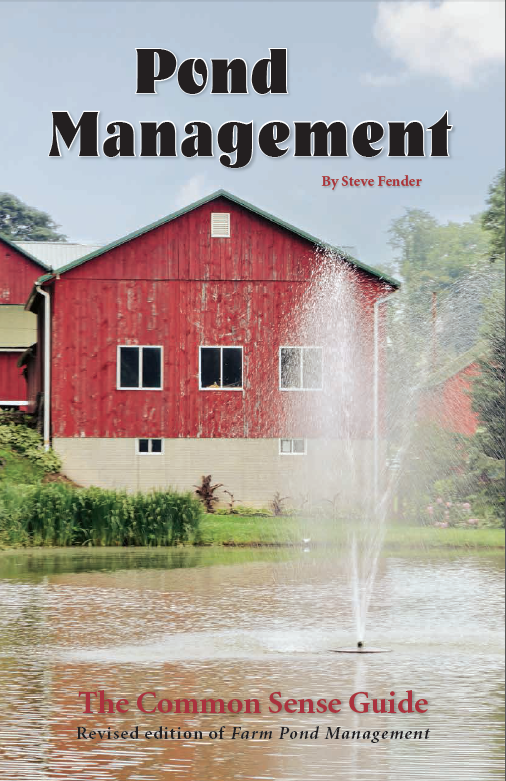 When we stocked our pond with fish, our Koenders windmill aeration system never failed us. It kept the pond well aerated during both the hot summer months and the freezing cold winter months, while many of our neighbors and fellow fish pond owners would experience massive fish kills. 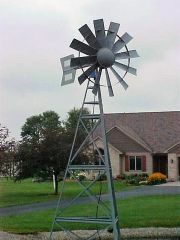 We are really excited about our NEW Koenders windmill that we have just purchased. If it can last even half as long as our old one we will be very pleased. We have had so many joyful years from using a Koenders windmill that we highly recommend your products to our neighbors and friends. Windmill is 16 Years Old with Original Parts! My Koenders windmill is at least 16 years old and I never had an issue. All the parts are original. Getting 16 years out of the original parts was beyond excellent. Our Pond Brings a Great Deal of Pleasure!! Our pond brings a great deal of pleasure to me, thus I want to keep it algae and muck free especially in the hot summer months where pond water issues area more predominant. This year we had a very hot summer, extreme temperatures that got up into the high 80’s, low 90’s and with the use of Koender’s Nature’s Pond Conditioner and aeration windmill I was able to keep my pond algae and muck free. My goal has always been to prevent pond water issues from occurring as opposed to waiting until there is an issue. My fish are really happy too!!! I have have been aerating my pond for several years even though i was doing this my pond water turned green, it looked like pea soup. I also had a fair amount of algae, so I called Koenders Water Solutions at the begining of the year to see what i could do to improve the water water quality and one of their pond consultants recommended that i use their Nature's Pond Conditioner in conjunction with the aeration. Well we are in October now and I am amazed how well it cleaned up my pond. It's crystal clear now and the algae has significantly been reduced. My fish are really happy too, we spend a lot of our time fishing. 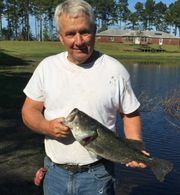 Actually when the pond consultant called back to see how my pond was looking, he was on the phone with my wife while I was in the midst of reeling in a 6lb big mouth bass as you can see me holding it in the photo.